American Academy of Pediatrics, 9781581108675, 200pp. 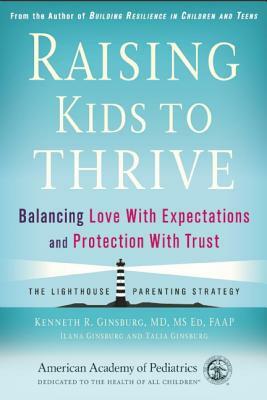 From award-winning author Ken Ginsburg comes this new work which explores an innovative idea in parenting: "The Lighthouse Parenting Strategy." This strategy answers 2 of the toughest questions with which parents struggle: 1) How do I give my child the unconditional love he needs to thrive, while also holding him to high expectations? and 2)How do I protect my child while also letting her learn life's lessons? This content includes some of the proven concepts based on positive youth development and resilience and combines new research with expert opinion to help parents consider how to approach these tough questions. Perspectives from over 500 teen interviews are also part of this groundbreaking work. Kenneth R. Ginsburg, MD, MS Ed, FAAP, is an associate professor of pediatrics at the University of Pennsylvania School of Medicine and practices adolescent medicine at The Children's Hospital of Philadelphia. He is author of Building Resilience in Children and Teens: Giving Kids Roots and Wings and But I'm Almost 13!" An Action Plan for Raising a Responsible Adolescent. He is the father of 2 children and lives in Philadelphia.